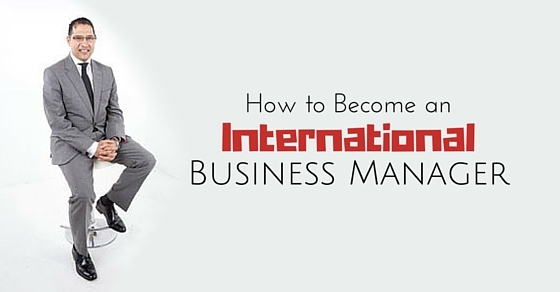 How to Become an International Business Manager? Almost all business has become international in scope and influence. It has been a fact that almost all businesses such as law, manufacturers, firms and other global companies have link with clients internationally. U.S. based firms have scattered their firms overseas and have their partnered firm across the globe for the growth of business. There are many companies that take initiatives to capture new markets and hence international business managers are essential for any business. There is massive growth in international business manager position and hence high demand prevails for the position across the globe. A degree of bachelor in international business school is mandatory for ones who desire to become an international business manager. Although various traditional degree programs are available, international business management degree should be your top choice as it helps the student to specialize in global business form, the first year. The degree covers up more of international subjects and hence a bachelor degree in international school of management is required. In order to become an international business manager, overseas experience is an important aspect so that the manager is able to work across national, regional and sub national boundaries so that business is propelled forward. Global executives understand difference between real business when it’s performed in same region and ones overseas. Ones who desire to become a successful business manager, the transcend of cultural perspective and getting to know the way business is done in various context is mandatory. An international business manager who desires to do business across regional, national and international boundaries are required to possess good negotiation skills. This skill is added to the gamesmanship at times of negotiating which makes you a great negotiator. One of the key global business management skills is the ability to say out what you mean in a clear manner without making use of an interpreter or by fumbling through a conversation. To be an outstanding international business leader and earn more brownie points you are supposed to speak in the native language of theirs. You will experience a shortage in balancing when you say something unintelligible and obscure and hence a well-spoken eligibility is required to become a international business manager. The local and regional processes should be unfold in order for your chore to be fulfilled though you, may be in a hurry. It is a fact that time and space is not the same in all places, the competitive and technological trends in accordance with local cultures are required to be balanced. And hence an individual who desires to become an international business manager needs to be patient in an impatient manner.
. The identities and affiliations with others are few aspects that need to be respected by a global manager. Only managers possessing a global perspective can think in a strategic manner to manage business, getting along with the right people from across the globe. The ability to think strategically comes from the experience of networking at the top level in global boardrooms and the way you look at industries the way they play internationally. In order to make strategic business, managers need to know where their business on the global scale resides. To be a successful International business manager, the manager should know the difference between honesty and truth as they widely vary in business scenarios. There are people who at times tell only the truth or even omit information which is required for people to know. In personal life, morality and ethics can be defined but in global business settings the executives should understand that are counted on them. You are sure to suffer when you don’t keep up and deliver promises. The need is to be balanced and managers are to be cautious at various contexts. Every global manager should possess the curiosity to learn and get updated with the latest happenings as the world is constantly evolving. Without the curiosity to learn, people would have less knowledge, and unable to discuss with their peers anything regarding business. It is always good for managers to stay abreast of the latest learning opportunities along with an humble awareness that whatever skill or knowledge one possess is not enough and as an international manager one needs to learn more. To become a successful international business manager, certain humility is to be present. Understanding others culture and how things are executed in their culture with regard to business is to be known. When you get across other cultures and lands, they must have figured solutions for different life problems. To become a good international manager, all these aspects regarding to humility must be understood. The managers must possess real intention and ability to listen by, in order to acquire this trait. To become an international business manager, the managers should make sure that they have interest in the culture and lives of other countries. There are many habits and aspects which can be unappealing for the managers but much of insight can be gained by means of experience. As a manager you should be able to recognize their culture and background and accept that they are not inherently superior in order to manage international business. It is a known fact that beliefs are something that might differ from others. This is an important aspect that adds to the success of global business. This characteristic is important which helps international managers to adapt and also tolerate the deep rooted belief of others and can find in more business opportunities. Management skills in all industries and business settings are equipped to all students by a number of bachelor’s degree programs. The course covers up important aspects such as communicating with employees, learning the basics of business, finding solutions for various common problems that happen in business and lot more. Operational complexities that happen in business of industrial, healthcare, commercial, governmental and non-profit organization are introduced to ones who desire to become an international business manager. An international business manager should possess certain skills to excel as a manager. Budding manager should make sure that he possesses these mentioned qualities to become the best international manager. Some of the skills are solid business skills, awesome leadership skills, and best planning skills, and strong coordination skills, in-depth problem solving skills, clear communication skills, report writing skills, presentable presentation skills, good computer skills, market research skills, analytical skills, interest in personnel management, and decision making skills. These aspects are important to outstand as a perfect international business manager. The company’s global strategy is managed by international managers. They are ones who oversee the complete departments in sales, finance or marketing and appropriate operations that takes place for foreign countries. Several employees or divisions are managed by international business managers in various geographical locations. Multitasking is an important quality that is required to stand as a successful international business manager. Since global operations are handled by the manager he is so called an international business manager. In certain companies, the international business manager is the only responsible person for all the foreign business of the business. Multiple global business managers are employed by many companies so that international sales, marketing, finance and overseas manufacturing are handled by these managers. International business managers have a very good reputation and good opportunities in many multinational companies. They are in high demand and required in the top most companies. They just need to develop the mentioned skills and experience in order to battle the competition worldwide. Becoming an international business manager needs more intention to develop required skills to get an international exposure. They also need to research and get to know the skills and experience required. Once experience is gained, getting through all these aspects mentioned is important. Proper preparation and interest in becoming an international manager is vital to get through the career in business management. The business world is wide and sailing through and wining in the business world requires taking into account all mandatory aspects.